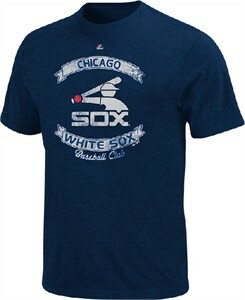 Celebrate the White Sox past when you wear the Cooperstown Legendary Victory T Shirt by Majestic which comes in Blue Heather that is made from 7.2 oz. comfortable 60/40 cotton polyester jersey material with a loose or classic-fit body. From the Cooperstown Collection this Vintage baseball t shirt is a short sleeve crew with a front distressed screened White Sox logo that gives this tee a worn look and as with all of our baseball apparel is Officially Licensed by MLB.